Left: Johannes Vermeer's Lady Writing, 1665. Right: Caspar Netscher's Woman Feeding a Parrot, with a Page, 1666. Johannes Vermeer's Young Woman Seated at a Virginal (1675) is much darker than the paintings most people associate with the Dutch artist. Even the dogs in Frans van Mieris' Brothel Scene (1659) are on message. So little is known about Vermeer. There are only 35 or 36 paintings of his left in the world, and right now the National Gallery is showing 10 of them — domestic scenes, many with glorious, gentle light. In Lady Writing (1665), lemony sunshine pours onto a woman's ermine-trimmed yellow jacket as light strokes her quill pen. That's the Vermeer most people know. The National Gallery exhibition, "Vermeer and the Masters of Genre Painting," has lots of letter-writing ladies. "The letter writing is a big theme," Wheelock says, "and it demonstrates one thing: the literacy, the level of literacy in the Dutch republic, and the importance of education." Women were educated (in fact, people at all levels of society were writing letters), and women also played musical instruments, as portrayed in Young Woman Seated at a Virginal and also in paintings by Gerrit Dou and Aert van der Neer. Dou and van der Neer may not be familiar names, but they were masters of genre painting. Their dazzling scenes of domestic life reflected the pride and prosperity of the nation: The Netherlands had just gained independence from Spain after 80 years of war, and peacetime brought stability and wealth. "There was a great sense of pride of who they were," Wheelock says, "and that feeling of pride is evident in every single painting in this [exhibition]. ... A great sense of, 'We are a small country but look at what we have done.' "
The paintings show gorgeous fabrics, Oriental rugs, glimmering pearls and pets. Parrots shipped in from Africa and Asia are patted and fed by sweet ladies. The woman in Caspar Netscher's Woman Feeding a Parrot, with a Page (1666) is pretty and plump. "She looks out at you very directly in a sort of come hither look," Wheelock says. "And the way she's holding the little biscuit for the parrot makes you wonder if there's something sexual underlying that gesture. We don't really know, but it is certainly possible." Most of the painted women look as virginal as the keyboards they play, but there is one exception. 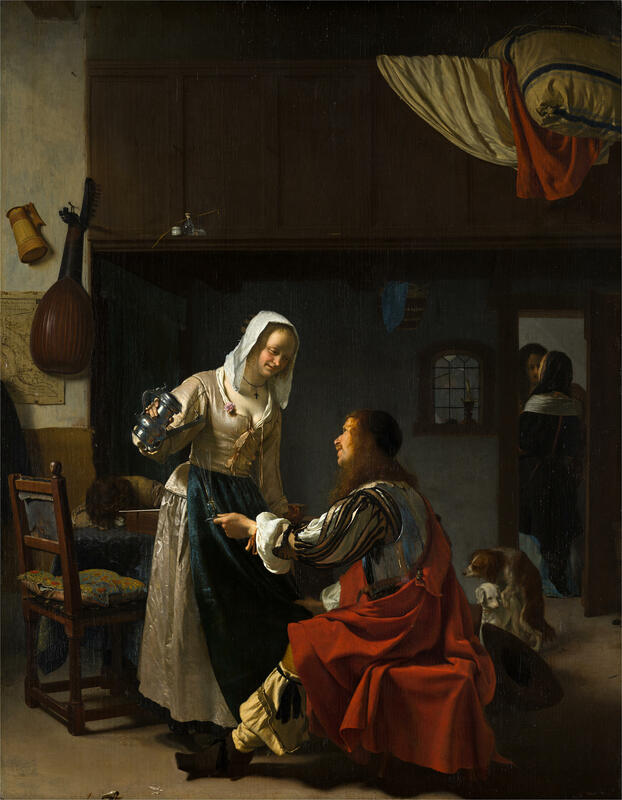 In Brothel Scene (1659), Frans van Mieris (who's right up there with Vermeer in his mastery of light) painted a smiling maiden tipping her pewter pitcher toward a red-cloaked soldier. "He's grabbing her apron to pull her towards him," Wheelock says. "She's pouring a glass of wine. There [is] bedding up above, there's a couple in the back room and there are a couple dogs that really make sure that you understand what kind of scene this is. ... They're at it." Dogs appear in plenty of these paintings (usually less passionately) and so do rugs and ermine-trimmed jackets. You wonder if carriages loaded up with these props were schlepped from Leiden to The Hague to Amsterdam to Delft and various painter's studios. Arthur Wheelock says some of the artists knew one another as teacher/student or drinking buddies, and they certainly knew one another's work. "They were familiar," he says. "... There are very clear relationships." The National Gallery exhibition shows just how many artists were at work in the Netherlands at that time. Among them all, Vermeer looms largest for his precision, the secrets in the faces he painted and the sheer beauty of his canvases. "There's something that keeps these works so alive, because you come back to them," Wheelock says. "And every time you see them, they're somehow different." The world of 17th-century Holland is filling up several rooms of Washington's National Gallery of Art right now. It is a world captured in paintings by Vermeer and some of his contemporaries. And they show well-to-do Dutch, mostly women doing ordinary things - getting dressed, writing letters, making music. NPR's special correspondent Susan Stamberg has more. SUSAN STAMBERG, BYLINE: This can't be a Vermeer. ARTHUR WHEELOCK: It can be a Vermeer. 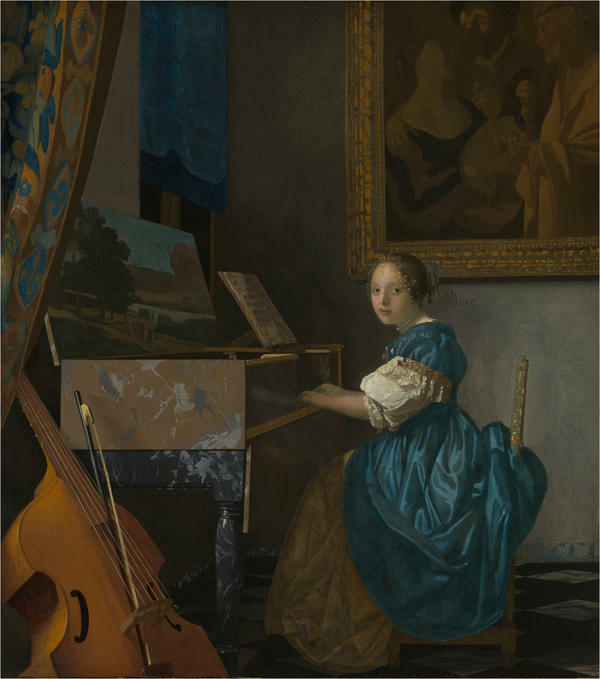 WHEELOCK: It's one of his very latest Vermeers, "The Young Woman Seated At The Virginal." STAMBERG: But she's klutzy at her keyboard, graceless, sitting in a dark room - none of that ethereal, luminous light Vermeer shines on his subjects. What's going on? He made it in the last year of his short life. WHEELOCK: We know that he died suddenly and maybe ill. So I don't know what effect that might have on this quality. STAMBERG: So little is known - just 35 or 36 paintings left in the world. The National Gallery is showing 10 of them - domestic scenes, most with that glorious, gentle light. "Lady Writing" from 1665 pours lemony sunshine onto the woman's ermine-trimmed, yellow jacket. Light strokes her quill pen. That's the Vermeer we know. There are lots of letter writing ladies in this exhibition, a favorite subject of several artists of the day - Ter Borch, Metsu. WHEELOCK: The letter writing demonstrates one thing - the level of literacy in the Dutch Republic and the importance of education. STAMBERG: Women were educated. They read. They wrote. WHEELOCK: All levels of society were writing letters - also demonstrates the importance of the postal service. These letters got delivered. STAMBERG: The women also played musical instruments. 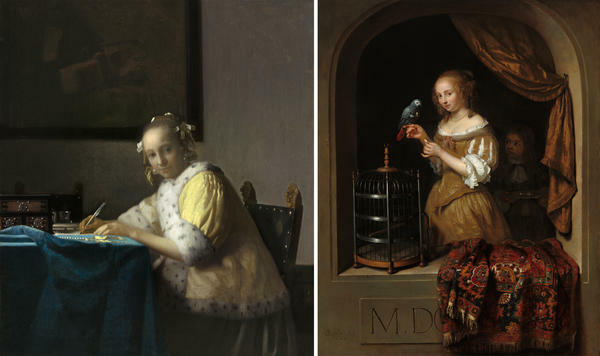 Vermeer and the virginals, also Dou and van der Neer - names we don't know, masters of genre painting everyday life. What was it about life in the Netherlands, then, that led to these paintings? Well, there was peace. After 80 years of war with Spain, the Dutch won their independence, beat the most important power in the world. WHEELOCK: So there was a great sense of pride of who they were. And that feeling of pride is evident in every single painting in this room - a great sense of, we are a small country, but look at what we have done. STAMBERG: Look at our gorgeous fabrics, our oriental rugs, our glimmering pearls, our pets, parrots - so exotic - shipped in from Africa and Asia, patted and fed by sweet ladies. Caspar Netscher's woman is pretty and plump. WHEELOCK: She is lovely. And she looks out at you very directly in a sort of come-hither look. And the way she's holding the little biscuit for the parrot makes you wonder if there's something sexual underlying that gesture. We don't really know. STAMBERG: Most of the painted women look as virginal as those keyboards they play. But there is one exception on a 1659 canvas by Frans van Mieris, an artist who is right up there with Vermeer in his mastery of light, the sheen and luster of his fabrics. The picture's called "Brothel Scene." A smiling maiden tips her pewter pitcher toward a red-cloaked soldier. STAMBERG: The dogs are at. STAMBERG: Dogs appear in plenty of these paintings, usually less passionate - King Charles spaniels. Dogs, rugs, ermine-trimmed jackets - the same objects pop up in many pictures. You wonder if carriages loaded up with these props were schlepped from Leiden to the Hague to Amsterdam to Delft and various painters' studios. Arthur Wheelock says some of the artists knew one another as teacher-student or drinking buddies. They certainly knew one another's work. WHEELOCK: They were familiar. Oh, yes, I saw that painting, and I'm going to do it in a very similar way. So there are very clear relationships. STAMBERG: The National Gallery shows how many artists were at work in 17th-century Netherlands - many great ones, many just so-so. But among them all, Vermeer looms largest for his precision, the secrets in the faces he paints, the sheer beauty he shows us. WHEELOCK: There's something that keeps these works so alive because you come back to them. And every time you see them, they're somehow different. It's not so much they have changed as you've changed. You come at a certain point when you're in a good mood or you're sad. And those different experiences inform how you actually approach the work of art. STAMBERG: The pictures are proof that the 17th century was indeed the golden age of Dutch painting. In Washington, I'm Susan Stamberg, NPR News. (SOUNDBITE OF YVONNE TIMOIANU'S "VIOLONCELLI") Transcript provided by NPR, Copyright NPR.